Local quartet The Pour celebrate ongoing growth with new EP and release show. Saturday, Oct. 13, 9 p.m.
Left to right: The Pour’s Nate Barkdull, Jeremy Whitesides and Matt Calder and Jesse Howerton . Every band has a calling card. For some, it's their ability to grind on tour; for others, it's their social media following. Some focus on hyping up their live energy, while others worry about cultivating their YouTube views and streaming numbers. 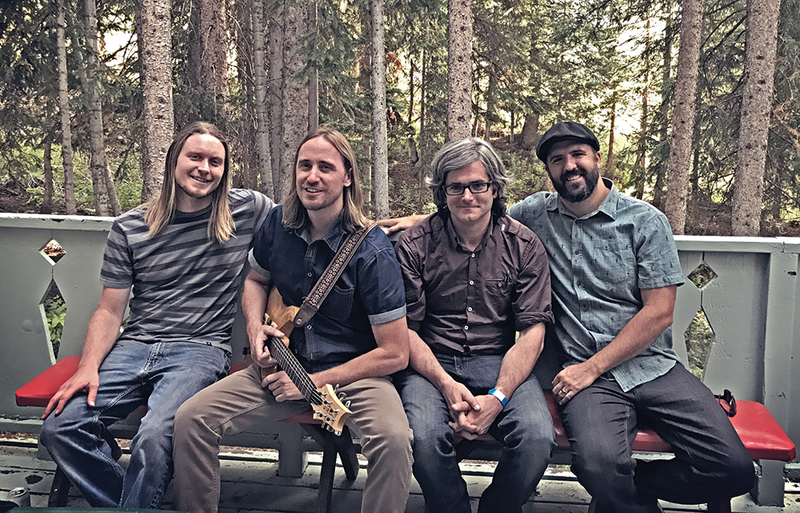 The focus for Salt Lake City quartet The Pour, however, is decidedly more traditional: writing creative original music, playing tight, hard-rocking shows and producing polished records that jump effortlessly from funk to prog-rock to jam band and back. Such genre-hopping is exactly what Matt Calder (bass and vocals), Jeremy Whitesides (guitar and vocals), Jesse Howerton (keyboards) and Nate Barkdull (drums) want to be known for. They occasionally cover Pink Floyd songs and cite Jimi Hendrix, Miles Davis and Radiohead as influences. But there's plenty to love on their 2010 full-length debut and their new EP, which they're celebrating with a release show at The State Room on Saturday, Oct. 13. Some songs feature a honky-tonk shuffle, some start and stop with pop concision and some run nine minutes with extended instrumental interludes. "We all like too many different kinds of American music to fit into any niche," Whitesides says. Ranging in age from their mid 30s to early 40s, each member of The Pour brings deep music bona fides to the table. Calder and Whitesides met in 2007, after Calder had built up credentials as a one-man band and Whitesides had accumulated significant studio experience. The duo recorded The Pour's debut album in 2010 with former drummer Jon Olsen, tracking the 10 original songs in warehouses, living rooms, closets and bathrooms. Still, it sounds like a professionally recorded affair. "We decided early on that we wanted things to be polished," Calder says. The Pour went on hiatus in 2011, but in 2016 Calder and Whitesides reunited with two new members: Howerton, who had worked as a full-time keyboardist in Asheville, N.C., for five years before moving to Salt Lake City in 2009; and Barkdull, who had paid his dues working in studios near and far, including at Los Angeles' esteemed Westlake Audio. Both say that joining The Pour gave them a new window on professionalism. "These guys are meticulous," Barkdull laughs. "This is definitely the most challenging music I've ever played in my life." The Pour's forthcoming EP reflects that scrupulous attention to detail. Each band member contributed writing ideas from his home studio via a round-robin of Google Drive files—and like he did on the 2010 release, Calder handled most of the mixing and engineering. But The Pour's frontman credits everyone for their collective efforts ("I rely on their ears," he says) while saving the highest praise for a surprising production method. "The best mixing console in the world is your car," Calder laughs. "That's our secret weapon. We listened to tracks in our cars, because we knew if we could get the songs to sound good on our crappy two-inch JBL speakers, it would sound good anywhere." That DIY nature is embodied in The Pour's newest development: a hand-wired, custom-built light rig that Calder constructed. "It might sound cliché, but Matt really is a mad scientist," Whitesides says. "He's singing, playing bass and controlling our whole light show with his feet." Synced up with the music, the rig lends a visual aspect to the band's exploratory sounds. "It's just another element of expression," Howerton says. "That's our goal: to combine technology with the live experience to create something new." Calder says these enhanced production values give the audience an extra dynamic while also helping the band tighten up tempos and consistencies. "We're picky—probably too picky—in the studio," he laughs. "Switching between the studio and the stage keeps us on our toes. Now, we've figured out how to build a bridge between the two and bring the same microscope we use on our recordings to the live arena." It might sound like a lofty goal for a local band. But a decade after The Pour initially formed—and, in its current iteration, with two years experience playing venues around Salt Lake Valley and recording their first fully collaborative creation—Calder, Whitesides, Howerton and Barkdull have their eyes on a bigger prize. Saturday's EP release show marks their first headlining gig at The State Room, and in 2019 they hope to crack the regional market in Colorado. Still, they acknowledge the struggles that any band faces today: balancing their respective work and family schedules, cracking the elusive social media code and developing a consistent fan base with such a diverse sound. "You can define a musical identity or create a container for your art to live in," Howerton says, "but that can keep you bound and prevent you from learning new things." Extending the metaphor, Calder adds, "Have you ever gone to Trader Joe's and gotten those assorted rice crackers? That's what a The Pour album is like: everything tastes good, but everything tastes a little bit different." Calling The Pour "an evolution and an escape" from their work with other bands, all four members say that no matter what happens, they're enjoying the ride. "If your goal is to be there, you're never going to be present here," Howerton says of the chase for bigger success. "Making good music that we believe in? That box has to be checked for all of us. We're proud of the integrity of our art."